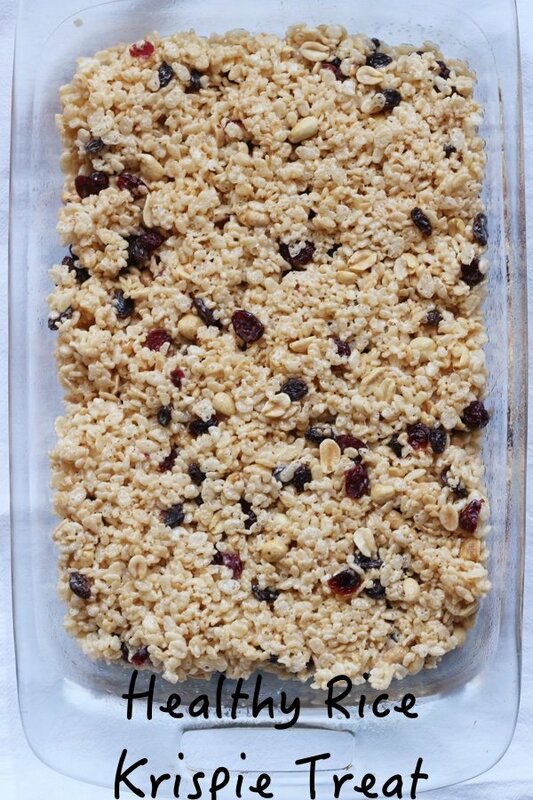 Healthy rice krispie treats merge the decadent with the hearty. This recipe is almost no more work than the original (which is simple). It is fun to try to make notoriously bad food into something healthier. Rice Krispie treats are screaming for a makeover. These treats are a lot like my fruit and nut bar recipe except heavier on the sugar. Usually made with Kellogg's Rice Krispies, marshmallows, and butter - these are crunchy, salty, and a kid favorite. Have you seen the size of the ones at your local cafe? They are way too big! I changed the original recipe by adding vanilla, raisins, and peanuts and I cut them into a reasonable size. 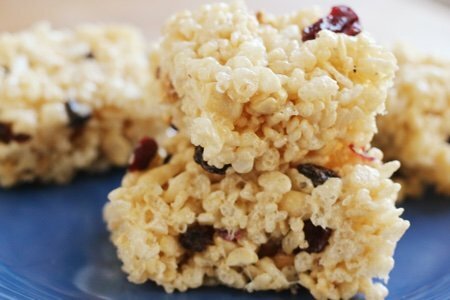 Rice krispie treats are so easy to make because the cooking involved is minimal. You simply melt butter (or coconut oil) and add marshmallows. Stir over low heat until the marshmallows are melted and then add everything else! They ended up tasting better, in my opinion, than the original version. The vanilla is a nice flavor addition and the added crunch of peanuts (or other nuts) is satisfying. My kids complained about the nuts and berries (sheesh) and then ate them all. Many of you will not like that I messed with such an icon of American cuisine. I do understand. You don't have to use the famous "Kellogg's Rice Krispies" to make the treats. If you are lucky enough to live near a Whole Foods or natural foods store, they have something called "Brown Rice Puffs" which are the same thing except that they contain the entire rice grain. 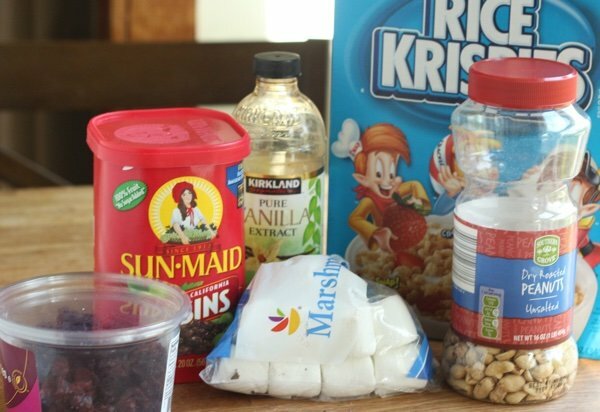 You can use any puffy cereal, really, that you like - wheat puffs, Cheerios, anything you have in your cupboard. I did use marshmallows, which is not the healthiest ingredient. I tried honey and it just didn't work. As I ate them, I kept missing the marshmallow flavor and I couldn't give them up. Another idea is to bring these to the bake sales at your school or church (or anywhere else you are supporting a non-profit). You will get lots of compliments on your revamp! How have you altered your Rice Krispie Treat recipe? Spray non-stick spray on 13x9x2 inch casserole. 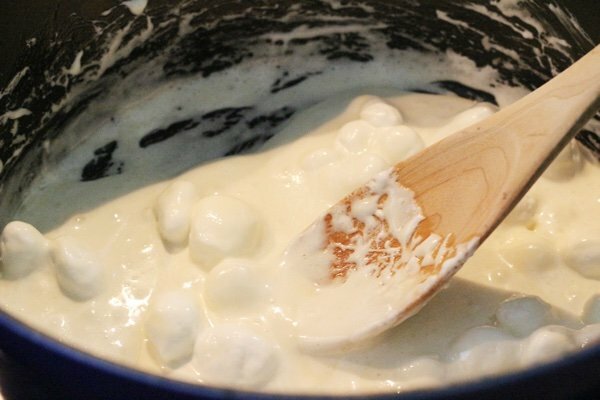 Melt coconut oil or butter in large saucepan over low heat and add marshmallows and vanilla. Stir CONSTANTLY until completely melted and mix in cereal and whatever else you choose to add in. Press into prepared pan. Cool for 10 minutes and cut into 20 squares. These are certainly better than the ultra processed ones in the blue packages! I liked the idea of vanilla. I have added other cereals into the rice crispies. If I have some fruit loops or flavored cheerios they go in too. I use 3 cups Fiber One cereal and three cups rice cereal. Also add 1 cup toasted almonds and 1 bag of low sugar Craisins. This makes me laugh! What a great after-school activity. Ready so fast! Thank you. I don't feel these are very healthy when you look at all the sugar,marshmallows, dried fruit and the rice cereal. Just look it up. Yes it might be more healthy with the fruit add. But I won't be making it. I grew up with my mom making these with half Rice Krispies and half Puffed Rice. Didn't realize until much later that most people used all Rice Krispies. Not sure why. I did grow up in a very large family so maybe the Puffed Rice was cheap and a way to stretch the servings??? Guess I never asked. This looks great for at home. But we can't take peanuts or any tree nuts to school for any purpose. Sunflower seeds might work, but they taste bad. Maybe there are soy nuts out there. I'm still hurting over the prohibition of nutritious foods because one child in several hundred has a food allergy. Thanks so much! I have been online looking for an eggless oatmeal cookie, but hadn't found one I thought would be that good. Now I have yours to try. And pumpkin seeds would never occur to me. I'll look into that. I'm just a bit frustrated by having to live with someone else's food restrictions. We are so blessed not to have them. At times I wonder, if we restrict foods, will we become intolerant too? I add about 2 cups more cereal so reducing the proportion of marshmallows, then I like chopped walnuts or almonds, or sunflower seeds, or pumpkin seeds. Chia or sesame seeds are good. I sometomes crunch up rice chex, and add those for more crunch. Of course, if you are not being healthy, drizzle melted bittersweet chocolate on top. BarbL, could you substitute canned pumpkin for the banana in your recipe? Trust me, when you have food allergy issues, like I do, you read labels: I have a problem with soy, MSG, mushrooms, and turmeric and the soy and MSG are in a LOT of foods! Worse if I have to ask people what is in the food, too. A neighbor invited me to take some food home once, but I could not because of the seasoning. I can no longer eat things I used to enjoy as a child. I know it seems like a nuisance that because one person is allergic to peanuts no one can have them, but people and kids have their hands everywhere before they wash them and it can take so little to cause the reaction, which can be very severe. Rejoice that you and your family can eat and enjoy so many foods and treats now. @Karen: Pumpkin probably would be a great sub for banana, texture-wise. It's not exactly as thick but close. The biggest drawback might be the sweetness factor. I use pumpkin in smoothies and find it delicious but only if I also add 2 or 3 dates for some sweetness. The good thing is this cookie dough can be taste-tested raw to see if your taste buds are happy. What I might try is adding 2 tbsp. chia seeds to the pumpkin and applesauce first to see if extra thickness could be achieved. Chia seeds have no flavor on their own. Then use a bit of a natural sweetener to taste. A tbsp of coconut palm sugar or a tbsp maple syrup. You can increase the oats to keep the same consistency as the original dough. I'm adding the original video below. I didn't put it in my comment above because it is 5yrs old and starting to not provide a written recipe BUT you can still see from the video what the dough looks like. Happy experimenting! Let us all know how it works! We can't enjoy some foods as frely as we'd like because one child in school has severe allergies. It means our child can enjoy PB&J sandwiches for lunch kn weekends. But what is scary is that kids could have nut butter for breakfast and go to school with it on them. If it were my child I'd home school and put her in other activities with children. It's too risky. @Susan McAuliffe: First of all, I thought I was the only one still awake at 3am! OMgosh, about nut allergies, I hadn't even thought about having nuts actually 'on them' from an at-home meal! That IS extremely frightening. I agree that home-schooling would be my answer. I know several young moms who need to work to survive [not just for extras]. I really feel for anyone trying to live with these health worries on top of financial problems.